Go Ahead, Amazon; Make My Day! ON JANUARY 29th, the Swedish Aftonbladet newspaper reported that a number of migrants were attacked by a gang of “neo-Nazis” at the Stockholm railway station. The story spread like wildfire; many news organizations, including BBC, caught wind and wrote their own pieces on the matter. There was only one problem: the events in the article published by Aftonbladet never happened. At first glance, the “evidence” provided by Aftonbladet appears convincing. The report features a video of masked Swedish men being chased by the police. 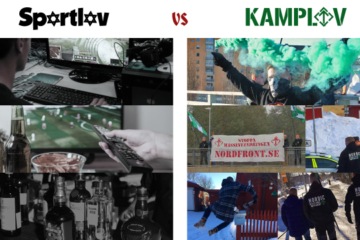 However, a closer inspection reveals that the video features no violence against migrants, but instead shows the police hitting the Swedish men with their batons. It would later come to light that these Swedish men gathered to peacefully distribute leaflets with information linking unaccompanied refugee children to increased crime. Aside from this debunked video, the only evidence provided by Aftonbladet for evidence of this alleged attack consists of an interview with a 16-year-old non-white named Christian. This individual claims that he was slapped in the face by someone at the railway station. 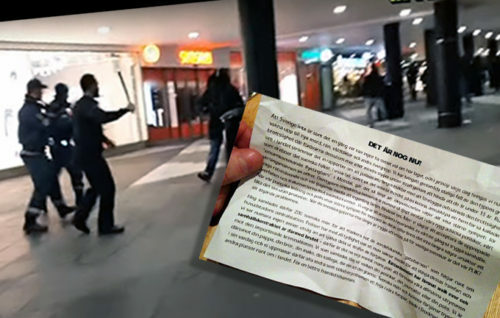 Since no police report was filed and there is no evidence to suggest that the alleged slapper was a member of the leaflet distributors, it can be safely concluded that this large-scale attack on a group of poor, helpless immigrants — carried out by malicious “neo-Nazis” — never took place. Unfortunately, this isn’t an isolated incident. The anti-white, pro-immigration “powers that be” in Sweden must resort to censure and deceit in order for the ongoing destruction of Swedish culture and dispossession of native Swedes to be successful. As such, there are many other examples in which they deliberately prevent the public from knowing the truth; the coverup of sexual assaults perpetrated by migrants at the “We Are Sthlm” concert, and the obfuscated manner in which the Swedish government reports the race and crime are but two examples of this. If allowed to continue unabated, the current invasion of Europe by non-white migrants will prove to be the undoing of western civilization as we know it. Thanks to decades of liberal brainwashing, ethnic Europeans have relatively low fertility rates, unlike their new Muslim neighbors. Ethnic Germans will be the minority in Germany in just one generation; similar trends are happening elsewhere in Europe, albeit slightly less dramatically. It is important to note that Europeans did not vote for this — it is being forced upon them. What will happen when ethnic Europeans are the minority in Europe? Will they be properly represented in a democracy? Will the new groups respect native European culture? Or will they seek to create a new Europe in their image? These questions are undoubtedly grim, but they are nevertheless ones worth asking — and I pray that I never see them finally answered. Liberalism is inherently myopic and thus thrives upon doing what “feels good” in the short-term. Such a position is anti-civilization and must be constantly challenged. Leftists know this — hence their reliance on censorship and deceit. Thus, it is our duty as Europeans and defenders of western civilization to expose their duplicity, and to do everything in our power to ensure that the truth is known. Searching for the Meaning and Purpose of Life?